Stability :Store at 4°C for several months, and at -20°C for longer periods; do not add NaN3 as this will inhibit the HRP enzyme. For optimal storage, aliquot target into smaller quantities after centrifugation and store at recommended temperature. For optimal performance, avoid repeated handling and multiple freeze/thaw cycles. 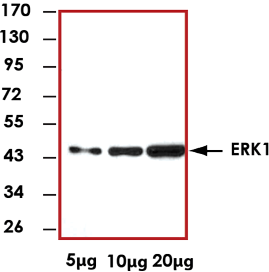 Sample Data :Representative western blot with a mouse monoclonal ERK1 antibody and Anti-Mouse HRP(1:2000) using 5 ug, 10 ug, and 20 ug HeLa cell lysate. Scientific Background :Affinity purified mouse IgG was used to raise goat antibodies specific to the mouse IgG. The goat immune serum is subsequently affinity purified using immunoglobulins immobilized to agarose. The antibodies are then conjugated to horse radish peroxidase (HRP) by reductive amination in a 2:1 molar ratio. The HRP conjugated secondary antibody can recognize the primary immunoglobulin and give a signal in the presence of a chemiluminescent substrate. The signal can be detected using an electronic imager or autoradiography film (1).